Kentucky Saddler is a Horse Breed in Red Dead Redemption 2 (RDR2). 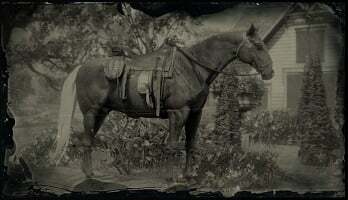 Horses are special creatures used as transport with different performance based on breed, and players can also bond with them for enhanced features. Kentucky Saddlers are classed as riding horses. They can be identified by their muscular, medium-sized frame and smooth gait, The Gray, Black, Chestnut Pinto, and Silver Bay are found in the wild. The Gray coat is also purchasable from a stable. Their good nature and handling make them perfect for riding short distances. This breed is known for being healthy, but is let down by poor Speed and Acceleration. The Kentucky Saddler is a medium build and muscular horse. These riding horses are hardy and easy to tend to.